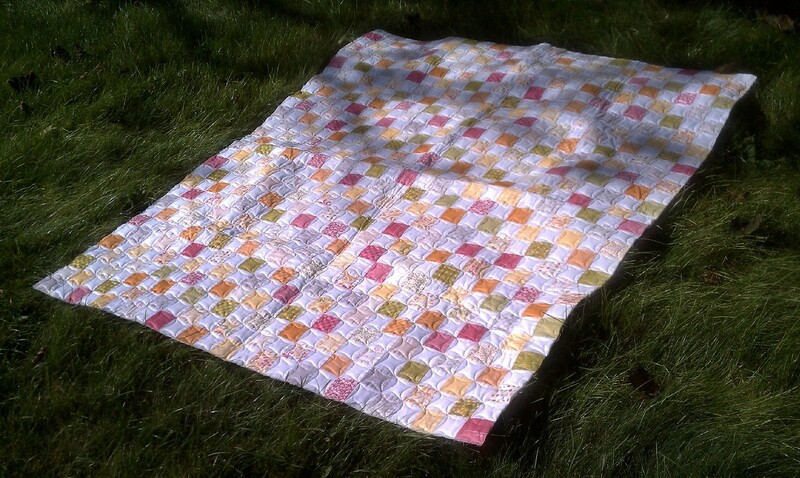 In case you are new here I'll share that my daughter (see previous post) is a quilter. And because she is a quilter, part of her wedding planning was to complete 13 quilts to celebrate the quilter she has become. 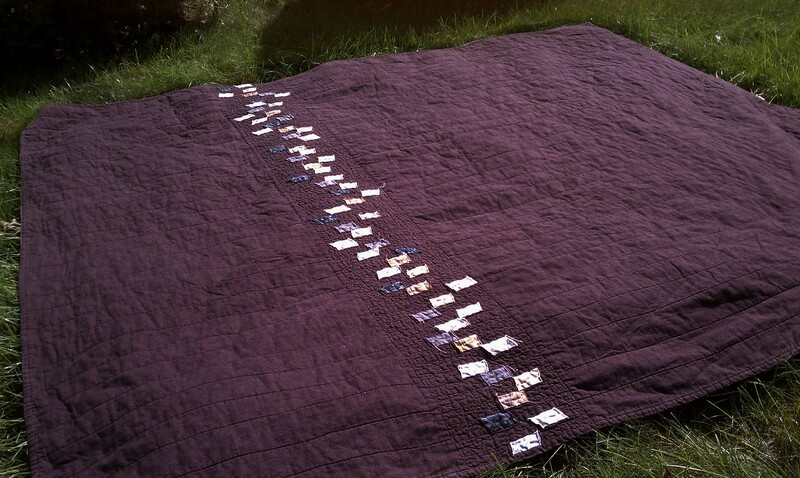 While Shiloh waited to be finished there was time for some simplicity and Nyshma found it in Rachel Griffith's postage stamp quilt along. 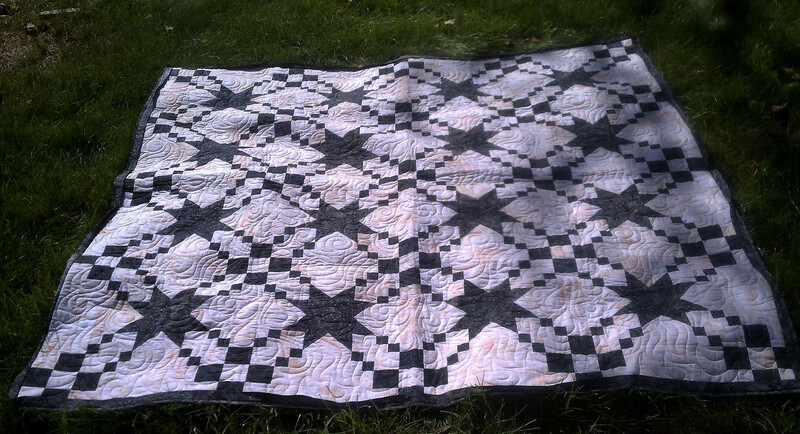 I had requested to make quilt #13 (yes, I'll come back to 11 & 12 shortly), which was the wedding quilt. Nyshma selected Bali Wedding Star as the pattern and I started working on it... and then stopped. 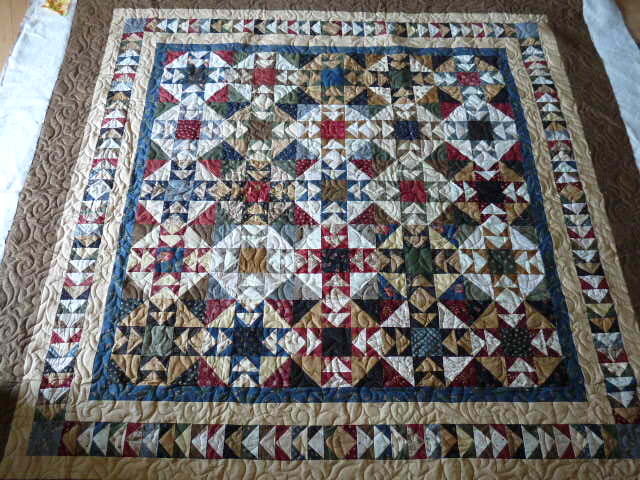 Call it lack of enthusiasm, loss love, what ever you want, but I could not finish that quilt. 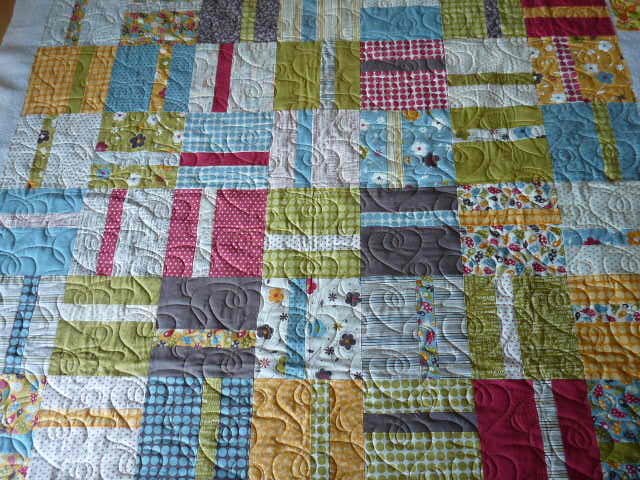 BUT, I had finished another quilt that I thought would fit right in and I brought it to the table as a substitute. 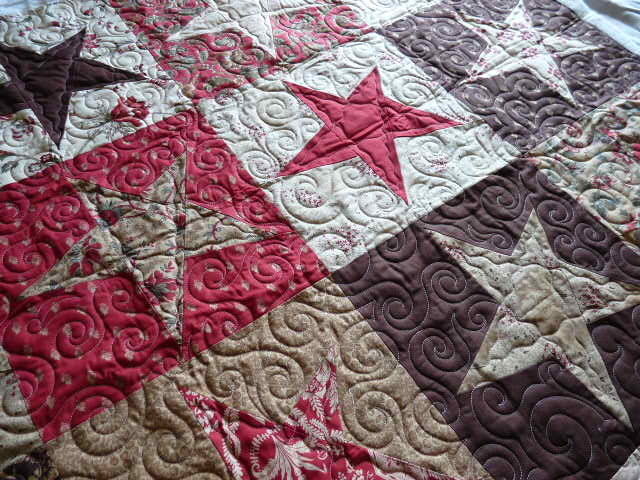 as her Wedding quilt until I complete Bali Wedding Stars. 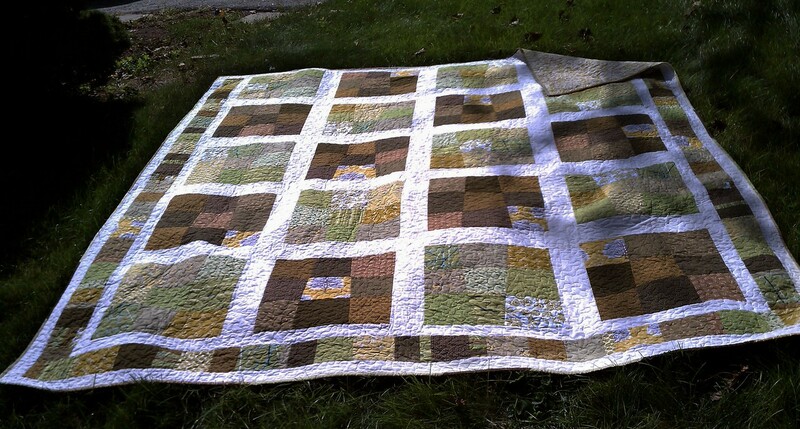 She wanted to make a companion quilt to the piece she made for her fiancee, Ryan. 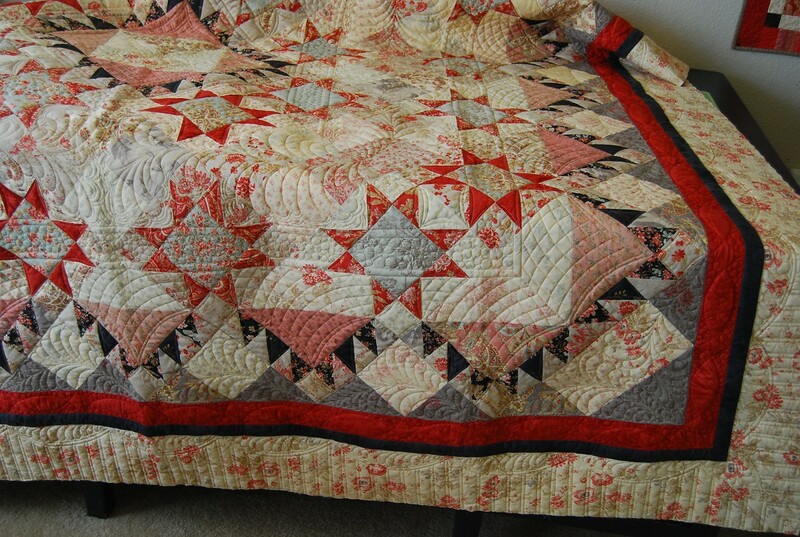 For it to compliment the earlier quilt she wanted to use the left over batik from that quilt. So, she put the fabric in the mail and selected a pattern from Kim Diehl's book Simple Comfort called Twilight Hopscotch. It arrived just in time for me to take to a retreat I was planning to attend and I start piecing immediately. 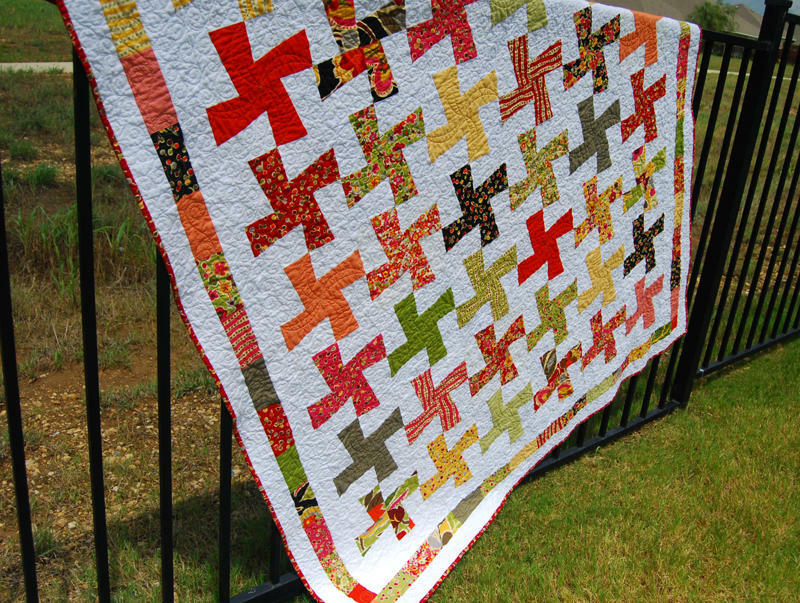 17 comments on "13 Quilts"
What a wonderful story! 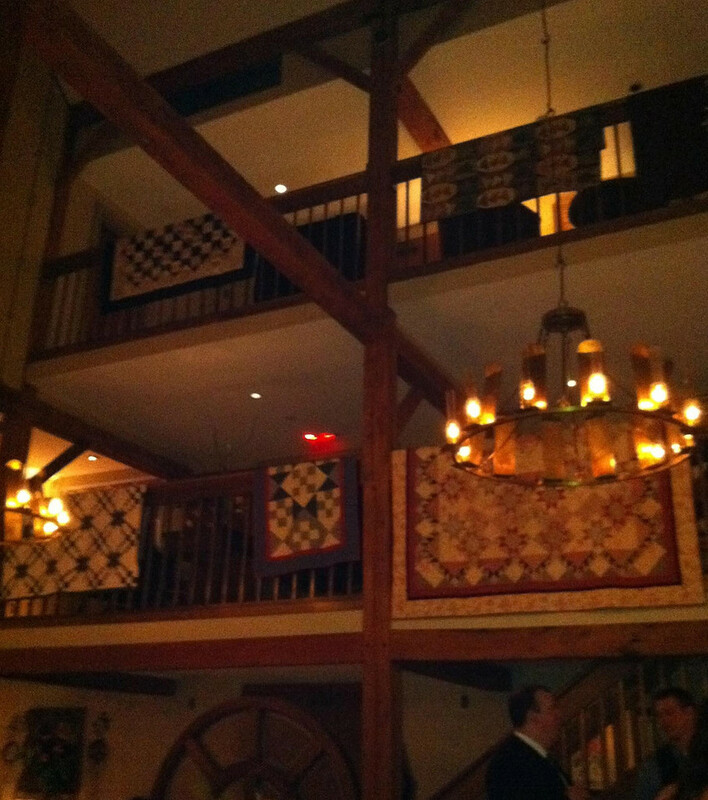 I love that your daughter used the quilts as decorations for the reception. Totally cool! 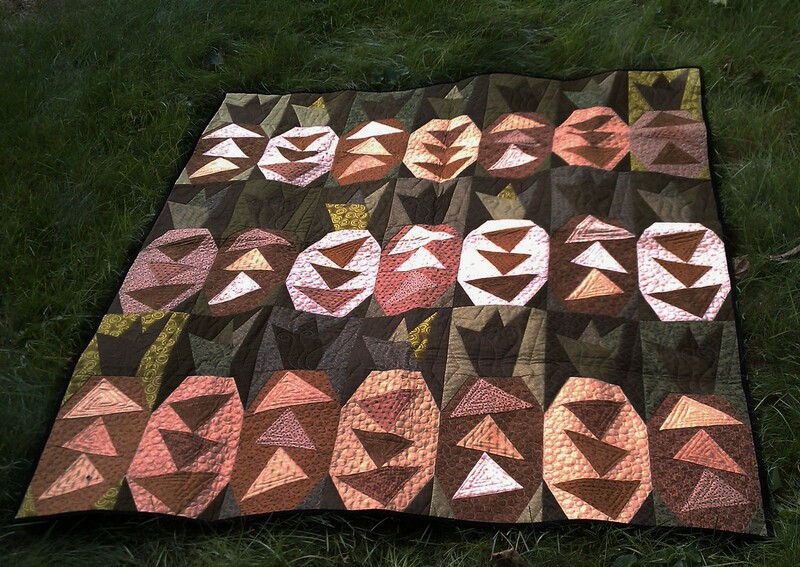 Sandy, thank you for sharing the journey of your daughter and 13 quilts. What a delightful story filled with so many memories. What a great post - I was glued! The quilts look great on the balconies - such a good idea! What a cool thing to do. Thanks for sharing the story and showing us all the quilts. What a fantastic story. 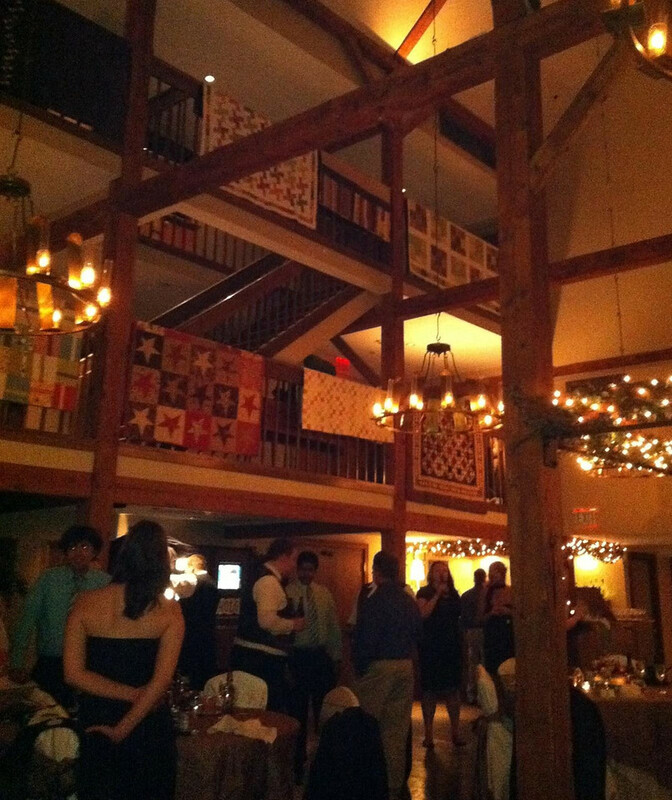 I loved how she used the quilts as decorations at the reception. Thanks so much for sharing. I LOVE your story--such an inspiration to you both. Thanks for sharing! What a wonderful story. I also loved the wedding pictures in the previous post. Such a beautiful bride! She also took on quite a task. I am so glad that it all came to be. What a great story. She's a very special young woman - very determined and knows just what she wants and how to get it. You must be very proud. what a story! and what a feat! I feel like a member of the family! I send tons of well wishes for the happy couple and you as well. Fantastic story, she is an inspiration to all of us. 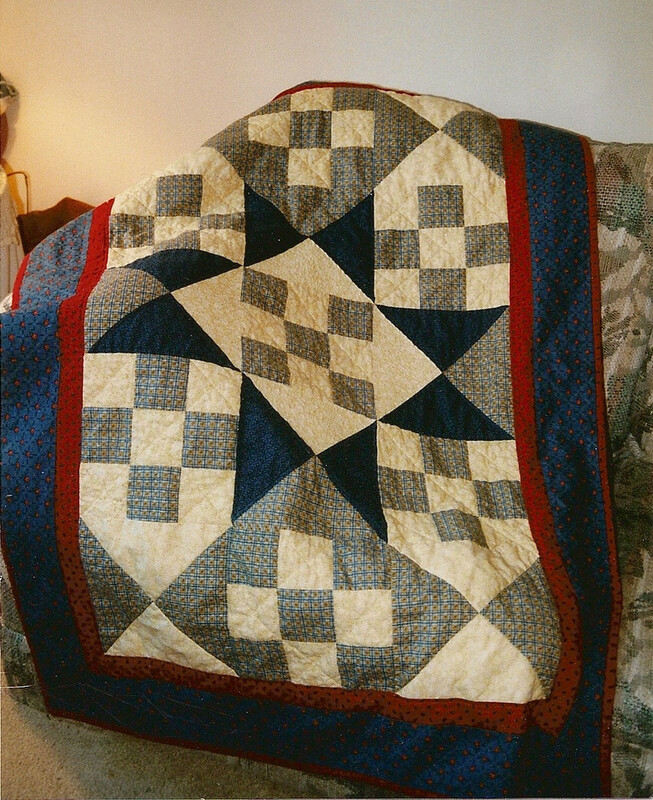 Quilt no. 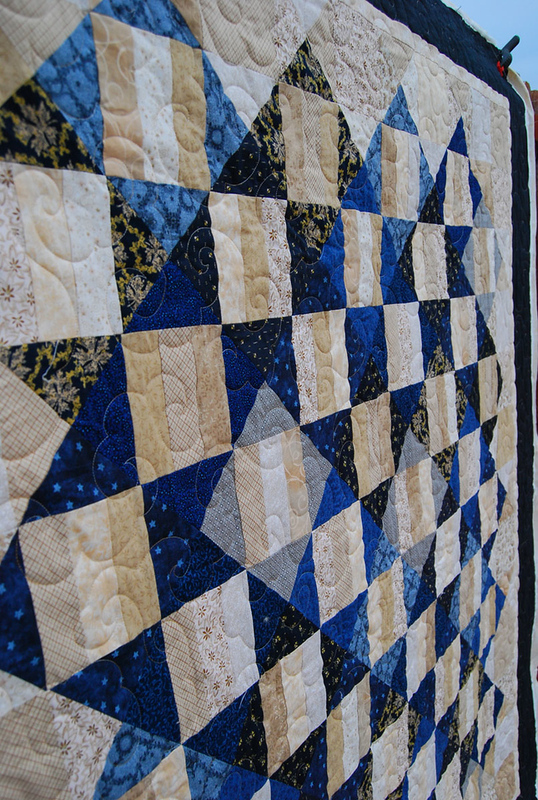 2 is called 'Rhythm & Blues' by Monique Dillard, and it was in the August 2009 edition of American Patchwork & Quilting. The only reason I know is that I am stalled on about row 4 - so many seams in that one to match up! 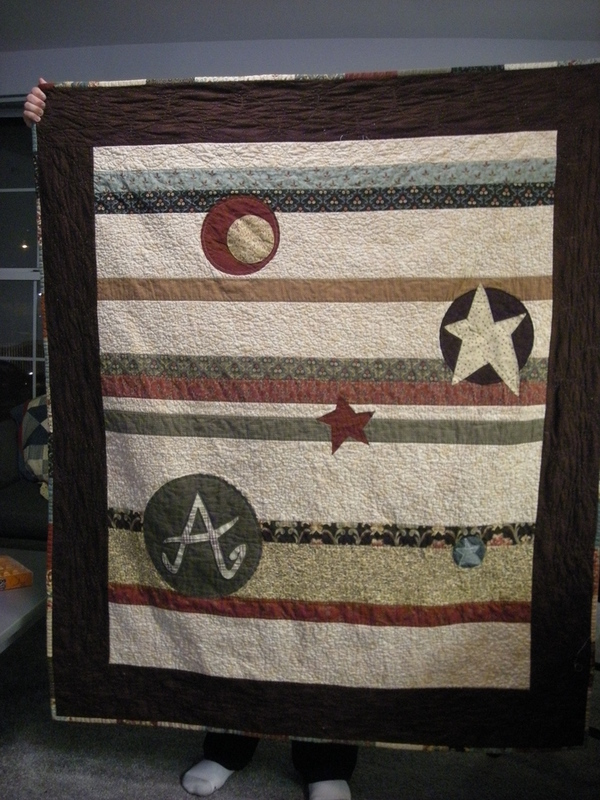 Hers is beautiful, hard to believe it was only her second quilt! what a lovely story! and i love that you decorated the railings with the quilts at the wedding. After asking a question on Google I was directed to this page. I had to stop everything to read about all the beautiful quilts your daughter made. Your help and that of others was no doubt an inspiration to her. I love that with everything else it takes to pull off a "modern" wedding, she managed to bring something "old and new" into the details. Bravo!